We’ve been eagerly awaiting the return of summer and it has finally arrived! Unfortunately, here in Vancouver the warm summer weather has not made an appearance quite yet. While you are patiently waiting for the gloomy days to pass this weekend, why not make a couple easy updates to your home? It will certainly freshen up your space until you can spend your afternoons on the patio instead of indoors! When you can’t spend time outdoors, why not bring it inside? You can breathe some life into your home with some living art – we are talking about botanicals, planters and terrariums! They come in a variety of sizes so you can place them just about anywhere. A simple botanical leaf like this one from CB2 in a vase can add a statement to your entryway. Small potted succulents, aloe or even eucalyptus can also be easily placed in your bathroom, bedroom and side tables. You can pick some up from Kermodi Living Art (one of personal favorites) or CB2 has faux pre-potted options. Feeling brave, why not pick out your own pot and take a trip to your local nursery for a fun weekend DIY? Large planters also look fantastic in your living room. 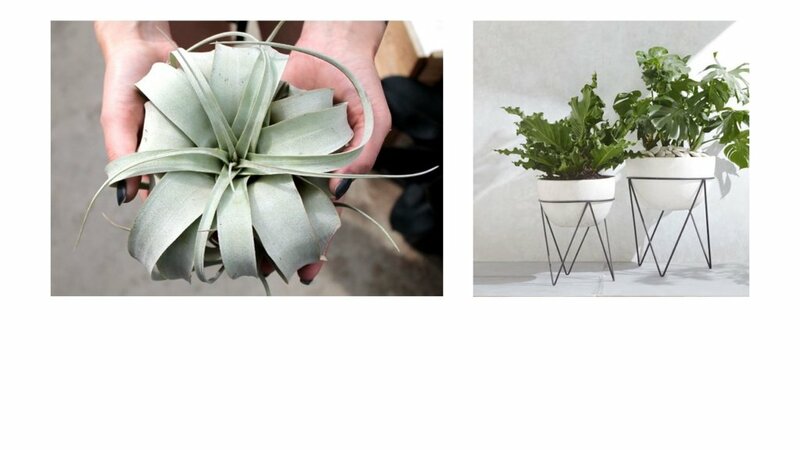 We currently love the look of planters elevated on stands like the Iris Planter + Chevron Stand from West Elm! For those of us who have trouble keeping plants alive, terrariums are your best friend! Fill one with some white stones and a few air plants (Art Knapp has a great selection) and keep a handsome brass mister like the one from Old Faithful Shop on hand to help you. Whether your favorite spot to hang out in your home is your living room or your reading nook, you can easily make some simple changes to help amp up your cherished moments of rest and relaxation! Just by swapping in some new toss cushions and throws your space will instantly be updated. If you want to keep your palette neutral, make sure to add some texture and pattern! Layer solid textures like the Muuto soft grid cushion in tangerine. After dreary winter months a pop of color can go a long way! Hay (great Danish furniture and accessorie line) offers mutlitple items with fun colors. Their Kaleido tray which comes in yellow, orange and apricot can offer a home for keys on an entry table, nightstand valet or coffee table catch all. How about scent? Fresh + bright + hints of wood describe a diffuser cocktail by local Vancouver brand Vitruvi. Be summer ready with bergamot, lemon or grapefruit essential oils. Pair that along with their minimalist white stone diffuser and what’s not to love? How will you update your space this weekend? Let us know with the hashtag #area3easyupdate or leave a comment below!